Did Your Motorcycle Battery Run Down? The motorcycle battery is obviously important, well duh, you can’t start a motorcycle without it, so it is important. However, it is probably the most neglected part of the motorcycle as well because it is slightly difficult to reach and take care of it because of its location. So it is quite frequently the battery which is a cause of breakdown of a motorcycle and this is what makes it important for the battery to be maintained properly. Considering the importance of motorcycle battery it is worthwhile to learn how batteries are made and how they work. A 12-volt motorcycle battery is made up of a plastic case containing six cells. Each cell is made up of a set of positive and negative plates immersed in a dilute sulfuric acid solution known as electrolyte, and each cell has a voltage of around 2.1 volts when fully charged. The six cells are connected together to produce a fully charged battery of about 12.6 volts. A battery uses an electrochemical reaction to convert chemical energy into electrical energy. Each cell contains plates made either of lead antimony or lead calcium. These plates are then converted into negative and positive charges using specific materials. This active material, coated on the plates is where the chemical reaction with the sulfuric acid takes place when is connected to the motorcycle. How The Motorcycle Battery Works! To understand how battery works, let see this: when a battery is being discharged, the sulfuric acid in the electrolyte is being depleted so that the electrolyte more closely resembles water. At the same time, sulfate from the acid is coating the plates and reducing the surface area over which the chemical reaction can take place. When a battery is charged it reverses that process adding the sulfate back to the acid. Charging reverses the process, driving the sulfate back into the acid. One downside of the lead batteries is that they discharge slowly over time even when they are not used. It is normally considered that this rate of discharge is about 1 percent each day though it is dependent on weather as well. The top priority of anyone possessing a motorcycle battery is that their battery should have a long life. One of the most important things to do for which is that the battery should not be kept in a partially discharged state. Another thing to take particular care about, for the long life of a battery, is to ensure that it doesn’t become over discharged that many times. Conversely, we must ensure that it doesn’t become overcharged as well. All these things considered, it is pertinent to check out the battery every now and then. Once a month would be great; take it out and check it. Charge it when the lights turn a bit dim or the motorcycle horn sounds or if the motorcycle hasn’t been used in a while. Check out the battery electrolyte level every three weeks or so. If the level seems low fill it up but only with distilled or deionized water, be sure to use only distilled water; tap water can damage a battery. Be sure to wear gloves and protective glasses because batteries contain strong acids which can be extremely dangerous for eyes and, well, not good for skin too. Also try to do it in a well-ventilated place because a battery does give off fumes. Try to keep the top of the battery clean and free of grime. Be sure to check cables, clamps, and battery case for any damage or loose connections, just in case. Also clean the terminals and connectors when you feel necessary. Once you are done with checking electrolyte and stuff, be sure to replace caps firmly. Another important tip is that don’t leave your batteries lying around. If they are not used or thrown storage they can become unable to carry charge. Keep your battery warm, so that it does not freeze in extremely cold weather, if your bike is outside while the temperature is below 32 degree Fahrenheit it is advisable to remove the battery from motorcycle and keep it somewhere warm. Trickle charge your battery at least once a month. If you want your battery life to be good and long it is extremely important that you keep it maintained; maintain it once a month, make it a routine. Batteries, as already mentioned, that are not used for long periods of time (a month or so) can end up with sulphation on the battery plates. If that were to happen, they would become rather difficult to charge and their performance and running time would start reducing very quickly as well. A smart charger can be used that transfers power from a standard AC outlet to your motorcycle's battery. This way a motorcycle battery would remain fully charged and well-maintained without the side-effects that come with charging it through trickle chargers and this would save the batteries from freezing in winter as well, unless it’s extremely cold where the battery is. A trickle might not be as effective as a Smart Charger but it works well enough for its job and is less expensive. So it can be used as an alternative though unlike smart battery charger, a trickle charger will not stop and will go on charging even when the battery is actually full due to which it becomes necessary to connect and disconnect to the power and motorcycle battery in intervals after the batter has been charged. There are methods to take care of that as well. If you haven't had a situation where your custom motorcycle battery gets drained while you are on the road, it will happen to you someday. It is simply one of those things that everyone experiences sooner or later. Maybe you left the head light on; maybe there's another reason, but it will happen and usually when you really need to get somewhere or return home. Of course, it won't happen in a place that your handy motorcycle battery charger is in your saddle bags. How Can I Jump Start My Bike Safely? 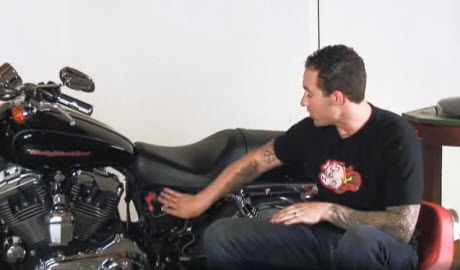 When jump starting your custom motorcycle that is having a battery problem, you need to be very careful or you can damage your bike or the vehicle that is helping you get started. The process is NOT exactly like jumping a car, so don't think that just because you've jump started cars from someone else's battery that you don't need to know how to prevent problems when trying to jump start a dead custom motorcycle battery. If you do it wrong, you may end up rewiring your custom motorcycle or buying the person who helped you jump start your motorcycle a new battery - or worse. Hopefully, you have a set of motorcycle jumper cables in your saddle bags when your custom motorcycle battery lets you down. If not, you CAN use regular car jumper cabled, but it is rather difficult to get them on the terminals of the small motorcycle battery. It can usually be accomplished with some determination. Locate another motorcycle if possible but you can charge your custom motorcycle's battery from a car is necessary. No matter what you do, if a car battery is involved, don't allow the car to be running at any point in the process. If you do, you are going to pass excess current through the motorcycle and probably fry the wiring and circuitry. Determine the positive terminal on your battery. Attach the red or positive clip of the jump cables to that terminal. During the connection process, you must make certain that all the cable clips are never allowed to touch. Determine the negative terminal of the good battery and attach the black or negative clip on the other end of the cables to that terminal on the good battery. Attach the other black clip to the negative terminal of your custom motorcycle battery. If you simply can not get the terminal onto the small motorcycle battery, you can ground the cables to a metal location on the frame. Now, the crucial part begins. If you are jumping a dead battery from another motorcycle, start the motorcycle with the charged battery and wait a few minutes to allow the charge to pass from that motorcycle to your custom motorcycle's battery. If you are using a car to charge your custom motorcycle battery, do not start the car. After a few minutes, try to start your custom motorcycle. Hopefully, your battery has charged sufficiently to crank easily. If not, check that each terminal clip has a good connection to the battery terminals. If necessary, wiggle the clip to get a better bite into the battery terminal. Wait a few minutes and try again. After you successfully crank your motorcycle, let it fast idle for a few seconds to ensure that it will not die when the connection between your custom motorcycle battery and the donor battery is broken. Remove the cable clips in the exact opposite order that they were connected. If there appears to be no problem except that you ran the battery of your custom bike down, be sure to ride a while to get a good charge into the custom motorcycle battery. If your custom motorcycle battery still does not crank your bike, you may have a shorted battery or another problem and will need to call for assistance. If you have roadside assistance, you can get help no matter where you are. If not, you will need to call someone to come get your motorcycle and take it to a location where you can find out why your battery will not crank your bike.